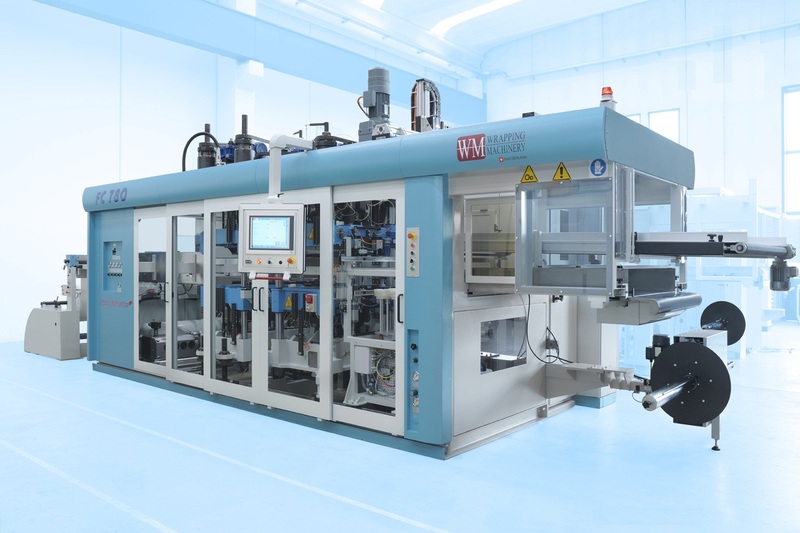 Kobusch UK Ltd., (part of the US and European based Sun Capital Partners Inc.), are pleased to announce the purchase of Five FC 780 IM2 Speedmaster Plus thermoforming machines for delivery in the first half of 2013. These are being acquired from Swiss based WM Wrapping SA, and follows on from similar investment in 2011 and 2012. The W.M. FC 780 IM2 Speedmaster Plus, which has the possibility to form and cut in-mould, represents the latest evolution of electric thermoforming machines and it has maximum tool dimensions of 780×570 mm and a maximum forming height positive/negative of 130mm. Kobusch UK Sales Director, Tony Mitchell, says “the previous six machines have been a success and the versatility they bring has helped us move into new areas of thermoforming and, therefore, has given us extra growth”. Machine movements are made with servo-motors which allows high rates of production up to 54 cycles per minute, depending on the material, and reduced energy consumption. The sheet heating section is equipped with both upper and lower heater banks with infra-red ceramic heating elements with independently controlled zones which allows, according to the type of material being processed, the optimisation of the heating phase. Forming is by means of compressed air (up to 8 bar) and vacuum, which can be programmed in the required sequence with quick change between the upper and lower platens. The products are cut out using heated steel rule blades and then automatically counted and stacked. The forming unit, with a toggle closing movement, guided along four tie bars, develops a clamping force of 75 tonnes on four points of the platen. This provides a greater rigidity of mould clamping and a more homogeneous distribution of clamping force giving the machine the possibility to form and cut in place. Adjustment of the upper and lower platen heights is electric and there is also the option to fit an independent electrically driven plug movement: “third motion”. The cutting unit, with a toggle clamping movement, guided along four tie bars, develops a power of 60 tonnes. This provides greater rigidity and a more even cutting force distribution. The machines are equipped with load-cells to measure the actual forming and cutting station clamping forces. All the adjustments and settings are made through the touch-screen colour LCD monitor, which are mounted on a control panel fitted to a sliding arm. All of the input data and recipes can be stored on a USB memory stick and a printer port can be used to reproduce paper copies of all of the video pages. Once the parameters have been entered into the machine it is able to generate an optimised automatic cycle. The machine is compact thanks to the integration of the electric cabinet within the footprint of the machine. 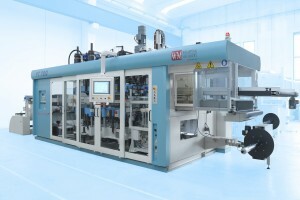 Tools are changed from the operator side to allow the best possible access to facilitate quick mould changes, which is aided by the quick tool loading equipment. The FC 780 IM2 can also be supplied in a 4 station version with a hole punching press, model FC780E HP.